If you dread climbing up a flimsy ladder that leads you to the attic and you're not blessed with a basement. Chances are most of the stuff you're not using on a daily basis are kept in your garage. Before you know it, you will be forced to park your car on the street as accumulated junk and tools are taking over your garage. Luckily, you won't have to throw things away or box them up to relocate to a storage unit that you'll have to pay every single month until you die! Yes, that's right. All you need to do is to free up the space in your garage through the use of the right garage organization system. You have the space already; it is time for you to utilize what you have effectively! As you'll need guidance in making a selection, we've listed the best of the best storage solutions that will be all you need in making your garage clutter-free and organized. We've also included some tips on how you can pick the right one based on your specific needs. So, what are you waiting for? Scroll down! Another good investment for those who wish to have every inch of valuable space utilized and properly organized is the Dream Garage Deluxe Storage Cabinet Set. The entire storage system comes with high-density polymer panels that can carry an astounding weight of 100 lbs. per square footage. Each shelf has a load rating of 50 lbs. and each cabinet added with metal handles as well as soft, quiet, and secure close hinges. This complete garage storage solution offers more than enough storage space. As it boasts of a silver-finished wooden construction, its sturdiness is unparalleled and it has a much longer lifespan. As for this storage system's robustness, it allows the system to carry a heavy load to ensure everything under the sun that can be kept in a garage is stored and tucked away. It can even hold your automotive gear effortlessly. The Wayfair Basics Complete Storage System is meant to be used in any room and not just the garage, so it is among the customizable options that you have. You can easily combine the storage system with other organization solutions to suit your needs. It's especially attractive if you're anticipating for space changes. Premium quality materials are used in the system's construction and added with a beautiful gray finish. When looking at storage solutions for any part or room of a home, it's important to make sure that they're safe. With this storage system, you won't have to worry about big cabinets coming down and knocking over valuable items as the entire system is meant to be mounted on a wall. It comes complete with two upper storage cabinets, two 3-drawer base cabinets, and two large storage cabinets. With overall dimensions of 72'' H x 120'' W x 16'' D, it can easily fit into any space regardless of size or configuration. A smaller version of the first garage storage system we featured, it only consists of two locker cabinets instead of three. It's the best choice if you want a high-end, well-known garage organization system that will do an excellent job but also is in the more inexpensive category. As it comes from the Bold Series of New Age, you get the assurance that it's a premium set of cabinets with a worktop that's made of an environmentally friendly material. Constructed of steel and a load rating of 3,000 lbs., it's one of the systems that are best around. Just like its big brother, it comes with lockable doors and the perfect finish which is almost impossible to get scratched. If you’ve been contemplating about getting the Bold 3.0 Cabinet Set but you think the storage space it offers is a bit overkill for what you need, then this one’s a good alternative. Its overall dimensions are 77'' H x 108'' W x 18'' D and you have the option of mounting the entire system on a wall or let it stand on the ground. Another excellent and incredibly stunning choice for those are in need of something massive is the Performance 2.0 Series 14 Piece Storage Cabinet Set. From its name alone, you already know that it's built to perform and deliver. It is bigger, heavier, and more expensive than the previous organization system, but it's the perfect addition to a large garage as it is made of 24 gauge steel. With its large size, humungous storage capacity of 6,000 lbs., and tough construction, there's nothing else that you need! With this complete garage organization system, you get 4 multi-use lockers, two 48-inch stainless steel worktops, two 4-drawer tool cabinets, 4 wall cabinets, and two 2-door base cabinets! It's definitely the ideal solution for ensuring items in your garage are free from dust, are out of sight, and out of mind. When set up, it takes 77.25'' x 216'' x 18'' of space. The next garage organization system on our list makes use of both open and closed storage. The Master 9 Piece Cabinet Set is a straightforward, convenient solution that's guaranteed to work in any garage with at least a single wall that measures 96" H x 240" W. There are three finishes to choose from to ensure a beautiful set is added to your space and the cabinets can be mounted or allowed to stand. Unlike inferior storage systems, this set doesn't require you to purchase separate add-ons in completing the system. 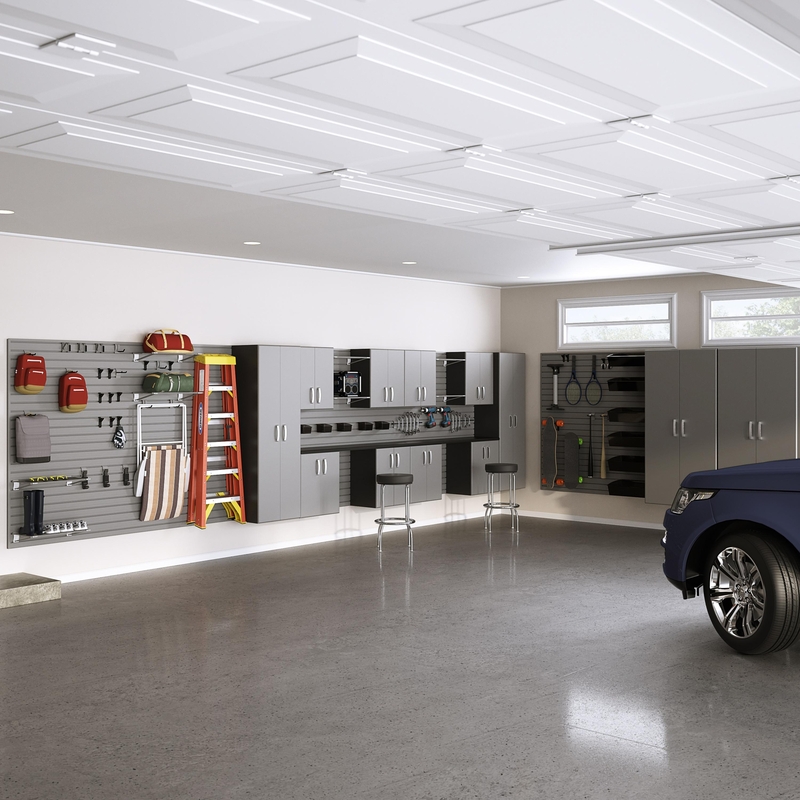 Apart from the full-size cabinets with soft close hinges and metal door handles, and panels for open storage, the system will come complete with "click-in" accessories such as L-hooks, short hooks, and long hooks among others to ensure your garage has a clean, organized, and polished look! First up is the safest and most secure garage organization system ever built, the Bold 3.0 Garage Storage Cabinet Set with Worktop. This storage solution is a great idea if you want to shut the doors and let everything be tucked neatly and out of sight. With its built-to-last construction, you can bet it's the ultimate storage solution. Of course, it will come with a premium cost, which is most definitely justified as it will be delivered to your doorstep complete with everything you need from 3 locker cabinets, a 2-door base cabinet, 2 wall cabinets, and two 4-drawer cabinets which are great for tool and equipment storage to a bamboo worktop. You also have different finishes to choose from and its installation or setup is totally hassle-free. An even smaller version of the Bold 3.0 Series is the 2-Piece Bold Storage System. The set consists of one multi-use lockers, one project center, and a worktop that's made of either bamboo or stainless steel, depending on your personal preference. As it's also a NewAge product, you already know that it's a premium set. Despite its trimmed size, it will still take your garage storage game to an entirely different level. With the adjustable shelving and lockable doors, the system can store sports equipment, skateboards, workshop tools, and extra shoes apart from the necessary maintenance tools of your home. When your garage or utility room is the main storage space within your property, this 2-piece set can already make a huge difference to the cleanliness and look of your home. Capable of fitting into any room, the multi-use locker measures 72" H x 42" W x 18" D and the project center coming in at 36" H x 62" W x 18" D.
If you simply want to bring organization to your garage and free up a massive amount of floor space without breaking the bank, then this rack storage system will give you all that and more. Loaded with heavy-duty polypropylene bins, this 7-tier rack will be all you need in storing supplies and items of different weights and sizes. The bins have dividers to further organize items stored in them and the package comes with labels to remind you of where you placed each item. The shelving unit also has heavy-duty wheels that can hold up even when they bear a heavy load for years. They can be locked down to ensure the rack doesn't slide when it should be stationary. Each shelf has a weight capacity of 150 lbs. When fully assembled, the entire rack measures 14" D x 36" W x 56" H, and it's ideal for both residential and commercial use. If you are serious about the utilization of every square inch of your garage, then you will find this highly personalized system to be the king of storage systems. It is easy to install and it's constructed from heavy duty galvanized steel. It's incredibly strong and it is capable of bearing a ton of weight compared to most pegboards. Mounting the pegboard set on a wall can seem intimidating, but it is actually pretty straightforward and simple. It's fast, too, as all the hardware you need will be provided. You can purchase the additional bins and hooks together with the set so you can instantly begin the cleanup and organization of your garage. The set measures 0.6 x 32 x 32 inches, so it can be added to any wall. A quick fix to your storage and organization woes is the 3x8 Overhead Garage Storage Rack Adjustable Ceiling Storage Rack. Since it's a storage rack that's meant to be installed on your ceiling, one can easily assume that its installation process will bring lots of trouble and headache. That may be true with other ceiling racks but this one's a breeze to mount. As a matter of fact, its installation can be done by one person just following the steps that are laid out on the manual. The best feature of this ceiling rack is the cold-rolled 14 gauge steel construction which allows it to have a load rating of 550 lbs! A much simpler, more traditional storage system is the Omni Tool Storage Rack, but you shouldn't underestimate it as it is the product that can bring organization to any space. Its design may be simple, but its construction is strong as it's made of heavy-duty steel. It requires little assembly and you can easily mount it on your wall. For your peace of mind, we suggest you pair this one with any of the storage systems on the list. Maximize the use of your garage door by adding the Cobra Storage Door Rack into your existing door. It will allow you to hang items like yard tools, fishing rods, ladders, and even spare or extra pieces of 2x4. Made of high strength ABS material, it's not just for garage doors; it allows you to make use of any wasted space. All you have to do is mount it! Robust, inexpensive, and highly secure, this Kayak Hoist Quality Garage Storage Canoe Lift will get the job done right and with no fuss. Its easy installation ensures that your gear is safe, protected, and off your flooring as soon as possible. Its maximum load capacity is 125 lbs. and it has a safety locking mechanism to ensure that your kayak doesn't accidentally slip while it's hoisted up. Assembly - Garage organization systems are known for being tricky and a headache to install. There are models that require no assembly while others involve the connection of small parts. If you don't want to do a bit of construction as your storage system arrives, then make sure that you acquire one that is easy and quick to put together. Features - As you know by now, garage storage solutions come in various shapes and sizes. There are those that are best utilized for small to medium size items while there are those that are meant to carry massive, heavy containers. If you have lots of heavy items in different sizes to store, then make sure your new storage system has features that can cater to your every need. Portability - Wheels are important for some as they provide numerous advantages. As storage solutions are loaded with myriads of articles that are quite heavy, a portable storage system will ensure that you won't have to carry a heavy tool or equipment from one part of your garage to another.